Alba Botanica Skin Care - Natural Very Emollient Body Lotion Maximum. Natural Very Emollient Body Lotion Maximum Dry Skin by Alba Botanica moisturizes and keeps skin soft and supple. Helps relieve dry&sbquo; itchy skin Soothes and softens dry skin Natural Very Emollient Body Lotion Maximum Dry Skin can relieve dry skin. This body lotion protects your skin from becoming chapped or dried. This lotion may potentially brighten the skin by removing dull and dead flakes. Shea Butter helps prevent wrinkles and dry skin. Grape Seed Oil makes the skin soft and baby-smooth. Green Tea Extract helps tone and moisturize dry skin. Natural Very Emollient Body Lotion Maximum Dry Skin helps ensure that the moisture is sealed deep into the skin. Natural Very Emollient Body Lotion Maximum Dry Skin 12 oz. (340 Grams) Includes the Following Ingredients: Butyrospermum Parkii (Shea Butter): Conditions to help prevent wrinkles and dry skin Vitis Vinifera (Grape) Seed Oil: Provides soft and baby-smooth skin Camellia Sinensis Leaf Extract: Tones and moisturizes dry skin These statements have not been evaluated by the Food and Drug Administration (FDA). These products are not meant to diagnoseÃ¢ÂÂ treat or cure any disease or medical condition. Please consult your doctor before starting any exercise or nutritional supplement program or before using these or any product during pregnancy or if you have a serious medical condition. Annemarie Borlind Bath and Body - Anne Lind Body Lotion - Guarana -. Anne Lind Body Lotion from Annemarie Borlind may help soothe the mind and body while hydrating the skin for a moisturizing and nourishing effect. This lotion may also provide aromatherapy to help elevate your mood and overall sense of well-being. Researchers reveal that aromatherapy traditionally uses plant materials and aromatic plant oils&sbquo; including essential oils&sbquo; which may potentially boost cognitive function and wellness. This product from Annemarie Borlind is suitable for all skin types. It provides Guarana aroma&sbquo; which may inspire and refresh your mood for a perfect day. This lotion contains simmondsia chinensis&sbquo; also known as Jojoba. Jojoba could act as an emollient&sbquo; and may have a moisturizing and nourishing impact on the body. Studies claim that jojoba may also have a soothing effect on the skin&sbquo; and could unclog hair follicles&sbquo; which may facilitate optimal delivery of nutrients. This lotion also contains water&sbquo; which could hydrate the skin cells and possibly improve cell function. The shea butter in this product may provide generous amounts of vitamin A and E. Scientists believe that vitamin A and E could play a crucial role in skin health and proper functioning of several chemical processes in the body. This product is hypoallergenic and free from preservatives&sbquo; mineral oils&sbquo; and silicone. It may be applied immediately after a shower or bath. Try Anne Lind Body Lotion Annemarie Borlind&sbquo; which may soothe your skin and relax your mind. These statements have not been evaluated by the Food and Drug Administration (FDA). These products are not meant to diagnoseÃ¢ÂÂ treat or cure any disease or medical condition. Please consult your doctor before starting any exercise or nutritional supplement program or before using these or any product during pregnancy or if you have a serious medical condition. Alba Botanica Skin Care - Natural Very Emollient Body Lotion Unscented. Natural Very Emollient Body Lotion Unscented Original moisturizes even the most sensitive skin&sbquo; keeping it healthy and glowing. Keeps the skin moist and supple Prevents water loss from the skin Decreases itching and flaking of skin Natural Very Emollient Body Lotion Unscented Original keeps the skin moisturized through the combined properties of various botanical emollient ingredients such as Shea Butter and Jojoba Oil. Shea butter contains various nutrients&sbquo; including Vitamin A&sbquo; which helps in managing skin-related issues. Jojoba Oil is a wax ester that is considered the most similar natural compound to human skin. Applying Jojoba Oil on the skin may assist in the natural oil production process of the skin&sbquo; preventing it from becoming dry&sbquo; itchy&sbquo; or flaky. Natural Very Emollient Body Lotion Unscented Original soothes the skin and keeps it healthy. Natural Very Emollient Body Lotion Unscented Original 128 oz. (3629 Grams) Includes the Following Ingredients: Shea Butter: Contains Vitamin A to help in forming and keeping healthy skin Jojoba Oil: An extract from the seed of the jojoba tree that keeps skin moist&sbquo; because it does not evaporate easily These statements have not been evaluated by the Food and Drug Administration (FDA). These products are not meant to diagnoseÃ¢ÂÂ treat or cure any disease or medical condition. Please consult your doctor before starting any exercise or nutritional supplement program or before using these or any product during pregnancy or if you have a serious medical condition. 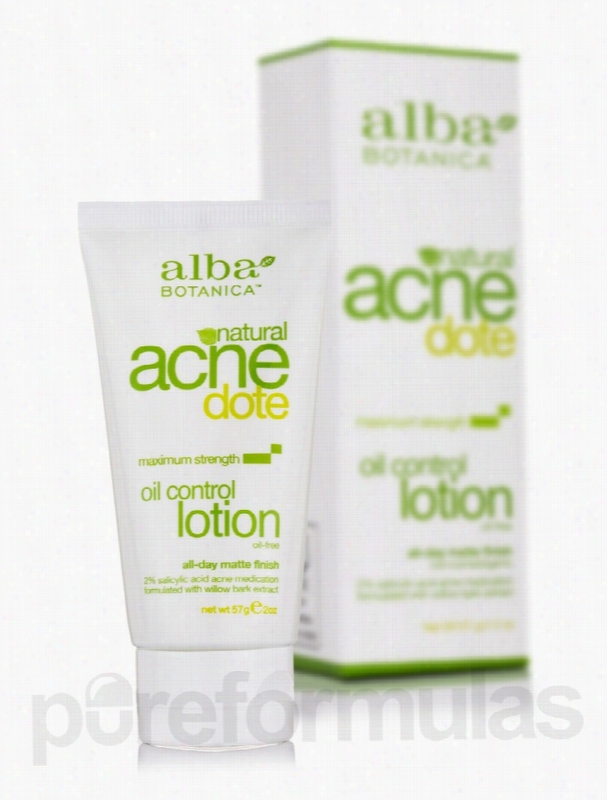 Alba Botanica Skin Care - Natural AcneDote Oil Control Lotion - 2 oz. Natural AcneDote Oil Control Lotion potentially aids and prevents acne&sbquo; while maintaining a shine-free appearance all day. Ultimate acne-fighting lotion Weightlessly hydrates the skin Natural AcneDote Oil Control Lotion is formulated with maximum strength 2% Salicylic Acid. Sorbitan Olivate is a unique emulsifier from olive oil&sbquo; which is free from Polyethylene Glycol (PEG). PEG-free products may reduce skin water loss and have a high moisturizing effect. Salicylic Acid could exfoliate your skin and reveal the healthy&sbquo; new skin underneath. Peppermint Oil contains menthol that possibly nourishes dull skin and boosts the texture of oily skin. Natural AcneDote Oil Control Lotion may help oily or acne-prone skin types. Natural AcneDote Oil Control Lotion 2 oz. (57 Grams) Includes The Following Ingredients: Salicylic Acid: Helps break down blemishes and control oil Ethylhexyl Stearate: Provides a softer&sbquo; smoother appearance on the surface of skin Cetearyl Olivate: Keeps your skin feeling supple and protected These statements have not been evaluated by the Food and Drug Administration (FDA). These products are not meant to diagnoseÃ¢ÂÂ treat or cure any disease or medical condition. Please consult your doctor before starting any exercise or nutritional supplement program or before using these or any product during pregnancy or if you have a serious medical condition. 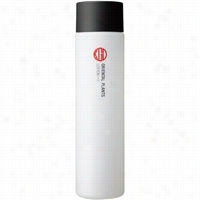 Koh Gen Do Oriental Plants Lotion 1 5 oz. Koh Gen Do Oriental Plants Lotion 2 5 oz. Alba Botanica Skin Care - Natural Very Emollient Body Lotion Daily. Natural Very Emollient Body Lotion Daily Shade SPF15 helps protect important proteins such as elastin&sbquo; collagen&sbquo; and keratin&sbquo; which keep skin firm and smooth. Natural protection from the sun Promotes smooth skin Natural Very Emollient Body Lotion Daily Shade SPF15 can help protect your skin from the harmful radiation of the sun&sbquo; and could also prevent premature aging. This daily lotion with SPF15 helps to decrease the risk of sunburn. Ethylhexyl Salicylate absorbs ultraviolet (UV) light and protects the skin from the harmful effects of exposure to sunlight. Homosalate acts as a chemical UV filter. Octocrylene protects your skin from direct sun damage. Natural Very Emollient Body Lotion Daily Shade SPF15 protects the skin from some visible signs of aging. Natural Very Emollient Body Lotion Daily Shade SPF15 32 oz. (907 Grams) Includes the Following Ingredients: Octocrylene 3.0%: Protects the skin from direct sun damage Ethylhexyl Salicylate 5.0%: Absorbs ultraviolet light and protects the skin from the harmful effects of exposure to sunlight Homosalate 7.5%: Acts as a chemical UV filter These statements have not been evaluated by the Food and Drug Administration (FDA). These products are not meant to diagnoseÃ¢ÂÂ treat or cure any disease or medical condition. Please consult your doctor before starting any exercise or nutritional supplement program or before using these or any product during pregnancy or if you have a serious medical condition. 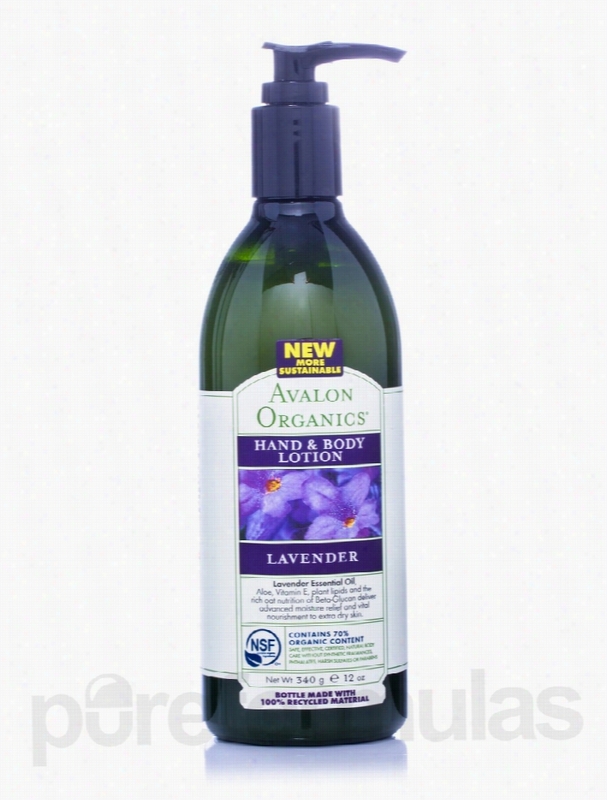 Avalon Organics Skin Care - Organic Lavender Hand & Body Lotion - 12. 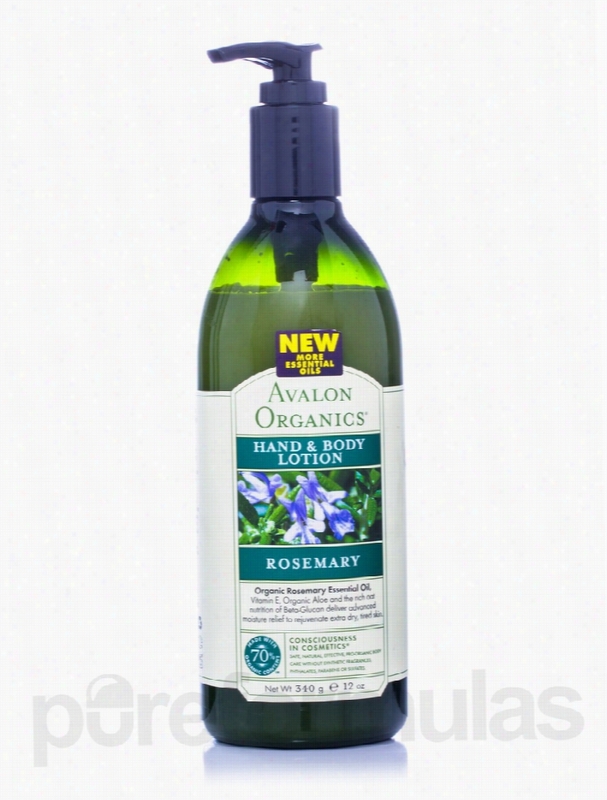 Organic Lavender Hand &amp; Body Lotion from Avalon Organics may restore skin balance to prevent drying. This lotion contains the goodness of plant extracts&sbquo; lipids and oils that may improve skin texture by replenishing it and nourishing it with natural moisturizers. Lavender essential oil rejuvenates skin at the cellular level. It is believed that lavender oil works on your skin and contains antiseptic and anti-inflammatory properties and works as a circulatory stimulant. Beta-Glucan present in this Avalon Organics body lotion softens skin to give you a rich and silky feel instantaneously. Aloe barbadensis leaf juice&sbquo; shea butter&sbquo; coconut oil and avocado oil leave your skin feeling soft and supple. Avocado oil may potentially help by maintaining the skin&rsquo;s elasticity and may reduce the many signs of premature aging. This hand and body lotion is certified by QAI to NSF/ANSI 305&sbquo; the American National Standard for personal care products containing organic ingredients. With no animal testing&sbquo; no parabens&sbquo; harsh preservatives&sbquo; synthetic colors&sbquo; fragrances&sbquo; phthalates or harmful sulfates&sbquo; Organic Lavender Hand &amp; Body Lotion from Avalon Organics prevents dryness and improves skin texture while keeping it moisturized. These statements have not been evaluated by the Food and Drug Administration (FDA). These products are not meant to diagnoseÃ¢ÂÂ treat or cure any disease or medical condition. Please consult your doctor before starting any exercise or nutritional supplement program or before using these or any product during pregnancy or if you have a serious medical condition.